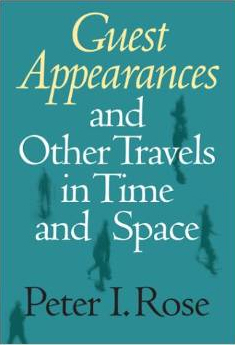 In Guest Appearances and Other Travels in Time and Space, “time” is the life course (at least up to the beginning of the 21st century) and “space” refers to the places the author has visited and written about. The first part presages the first chapter of the memoir Postmonitions of a Peripatetic Professor (2013); the rest of the book focuses mostly on sites, scenes and unique experiences. Peter Rose has traveled more than almost anyone I know, and has seen a great deal that other travelers miss. I think his essays are an accurate expression of the man — catholic in their interests and warmed by generosity. –Tracy Kidder, Pulitzer Prize winning author of The Soul of the New Machine, Among School Children and Hometown. An academic ethnography of significance — a life well lived, a cause well served. If you weren’t lucky enough to have Peter Rose personally introduce you to the discipline of sociology, now is your chance. This intimate reflection will excite the mind — and the imagination.